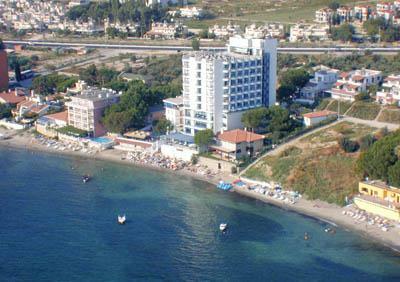 Grand Ozcelik Hotel is located in Kusadasi, 30km away from Ephesus and Priene, 40km away from Heraclea and Didyma, 50km to Miletos. 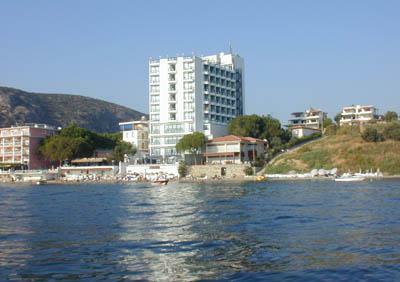 The transportation from Izmir Airport - 75km away and from Bodrum Airport – 110km away it is easy by using the highways. Breakfast venue * lobby bar * snack bar * pool bar * restaurant bar * indoor restaurant * 2 meeting rooms (350 pax max. cap.) * kid’s playground. 2 meeting rooms (350 max. capacity). Overhead projector, projection screen, whiteboard, flipchart, sound system, microphone, television, air conditioning, light system. Largest room capacity 250 pax, Ballroom 275 pax. 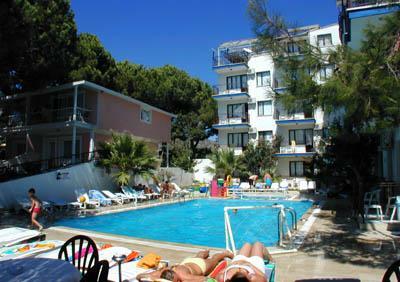 Outdoor pool * indoor pool * turkish bath * sauna * beach volley * table tennis. Massage * laundry & dry cleaning service * ironing * internet * doctor * coiffeur. Central heating and cooling * satellite TV * private bath * direct dial telephone * balcony * minibar.